The Chase Slate currently has an Informr score of 8.2 out of 10. This score is based on our evaluation of 18 sources including reviews from users and the web's most trusted critics. Chase Slate is typically available to those with good credit scores (650 or greater). 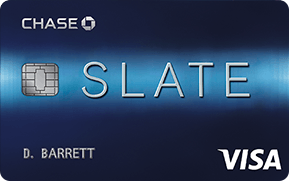 The Chase Slate card’s unique, no-fee introductory balance transfer offer makes it one of the most valuable balance transfer cards on the market. If you’re drowning in credit card debt, a balance transfer credit card like the Chase Slate may help you get out of debt. While the card itself is fairly basic, the balance transfer offer is consistently one of our top picks with its Intro $0 on transfers made within 60 days of account opening. $0 Intro fee on transfers made within 60 days of account opening. The Chase Slate is a strong card if you want to make a large initial purchase or need to transfer existing high-interest debt from another credit card. When it comes to long-term use, though, you might want to opt for a rewards card that also offers an intro APR on balance transfers, like the Chase Freedom. Helps you to pay your debt by offering a 0% introductory APR for the first 15 months on both new purchase and balance transfers with no balance transfer fee for transfers made within the first 60 days of opening the account. With these features, the Slate card can be an important part of paying off and eliminating credit card debt. Is getting rid of credit card debt your primary financial concern? If so, take a hard look at the Chase Slate card. The Chase Slate card could be just what you need to get out of debt. If you find that you are carrying a balance on your credit card, your first goal should be to pay down your debt. With its combination of features and tools specifically geared towards lowering your credit card debt, the Chase Slate is definitely one of the first credit cards to consider. The Chase Slate card is the only credit card Chase offers that doesn’t offer any sort of rewards program. It’s targeted towards people rebuilding their credit and those with existing credit card debt by offering introductory 0% APR rates and no balance transfer fees for the first 60 days. For rewards chasers, chances are this isn’t the card for you. The Chase Slate Credit Card is designed help users pay off their debt as quickly as possible. New cardholders can utilize the 0% APR on balance transfers and purchases to help meet their financial goals sooner. The Chase Slate Visa serves a unique purpose, and while you won’t earn rewards, the benefits you’ll receive from getting your credit card debt in order can position you to move on to a rewards credit card.